March 12 is Girl Scouts 105th Birthday! For over a century, Girl Scouts has inspired millions of girls to lead, by building our future leaders of tomorrow. 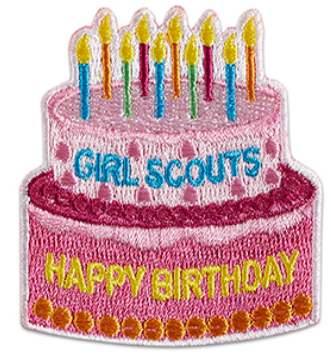 Happy 105th birthday Girl Scouts! Girl Scouts connects girls to a world of possibility in a positive and inclusive girl-led environment. Preparing girls to be go-getters, innovators, risk-takers, and leaders to make the world a better place. On March 12, 1912, Juliette Gordon Low founded the first Girl Scout troop with just 18 girls. Over 100 years later, more than 59 million American women are Girl Scout alumnae, and the program currently serves nearly 2 million girls. Virtually every female astronaut is a Girl Scout alumna, as are a majority of female CEOs. Although Girl Scouting has evolved through the years, the experience of being part of the Girl Scout organization connects generations of women. Girl Scouts is committed to ensuring that every girl has access to activities in science and technology, business and economic literacy, and outdoor and environmental awareness. Celebrate Girl Scout’s Birthday on Girl Scout Sunday by reconnecting with the Girl Scout Promise and Law. Learn more about Girl Scout history and our founder, Juliette Gordon Low; you could even hold a Girl Scout birthday party!! Do something to make the world a better place. Troop 61080’s Community Service in the Conejo Valley!